Ensure your regular dose of ways to live life to the full with a Woman’s Weekly Subscription. Buy a single copy or subscription to Woman's Weekly magazine. With life often running away with itself it can be difficult for women to find the time to prioritise their own wellbeing. A Woman’s Weekly magazine subscription makes it easy to stay on track when it comes to practical and positive ways to live life to the full and putting yourselves first. Woman’s Weekly has been delivering captivating content for the mature female for over 100 years. 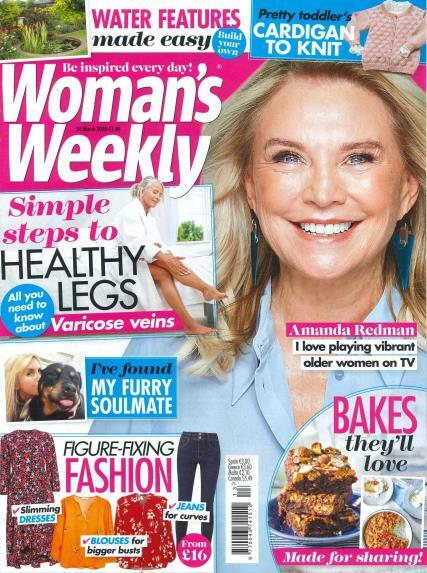 Featuring articles on every element of a woman’s lifestyle, Woman’s Weekly prides itself on helping women to feel fantastic whatever their age. If you’re retired or looking for a new hobby, Woman’s Weekly magazine is full to the brim with great home, gardening and craft ideas. In addition, its large focus on cookery helps its reader to get creative in the kitchen while its expert health advice, fashion and beauty tips ensure you feel fantastic inside and out. Celebrating real women, each issue also includes inspirational reader stories as well as short tales of fiction to allow a few moments of escapism. So with all this provided weekly, what else could you ask for? Take out a Woman’s Weekly magazine subscription today! It's woman's weekly . Always has been and always will be a great magazine full of different articles every week. A great read. I like this magazine because not only does it help me develop my artistic talents, it keep me up to date with the times. I never wish to miss a single issue of Woman's weekly, my mother's all time favourite magazine. My Mum-in-law really likes the subscription we bought as a present. So all very happy here.